There are so many ways that you can use a bathtub in the center of your bathroom, all it takes a is a little bit of extra inspiration and creative research and you’ll have the perfect layout and design suited for your needs and wants! Like so many people, we’ve all dreamed about having our dream bathroom, that bathroom that you know you’ll have a custom built in your home one day! There are so many designer layouts you can choose from and implement into your bathroom, from corner bathtubs to freestanding bathtubs, to bathtub and shower combinations. 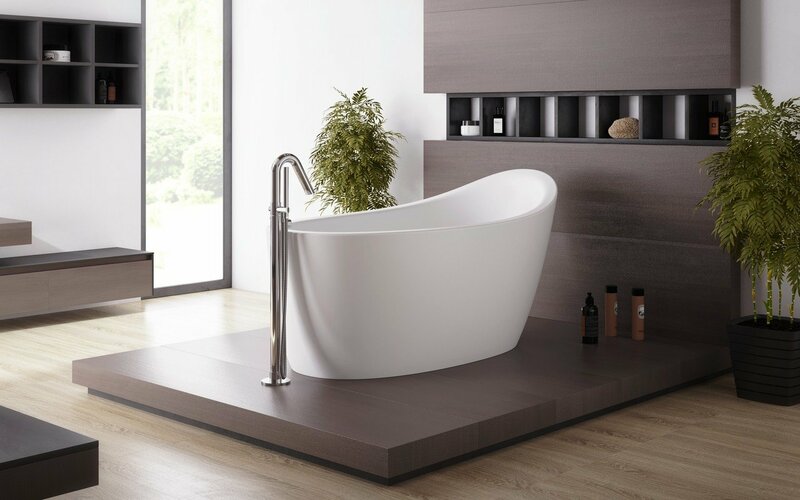 The latest and most interesting concept though is having a centered bathtub in your bathroom, and we love it! Now, with creating a layout like this, where your bathtub is the focal point, you can really play around with the concept and create a space that works for you and your lifestyle. We’ve noticed that there are two ways of using this look to your advantage, both functionally and from a design and statement bathroom point of view. Either you go for placing the bathtub in the middle of two gorgeous vanities, this way, you’ll create a separation, this is perfect for couple’s bathrooms, or en-suite master bathrooms. Of course, you could just go for the bolder and more sophisticated version of having a centered bathtub, and literally place it smack dab in the middle of the room, this is a daring but elegantly unique and awesome move for a bathroom wanting a statement design and layout, especially if you have the space to work with. If you have as much space to work with as the bathroom shown above, then by all means, this is your chance to have a gorgeously designed and Italian made bathtub in your bathroom. The slick and sleekness of having a freestanding bathtub right in the middle of a bathroom, will give it a very unique and spacious feel and look. We love clean and modern this bathroom looks with a freestanding tub right in the middle. 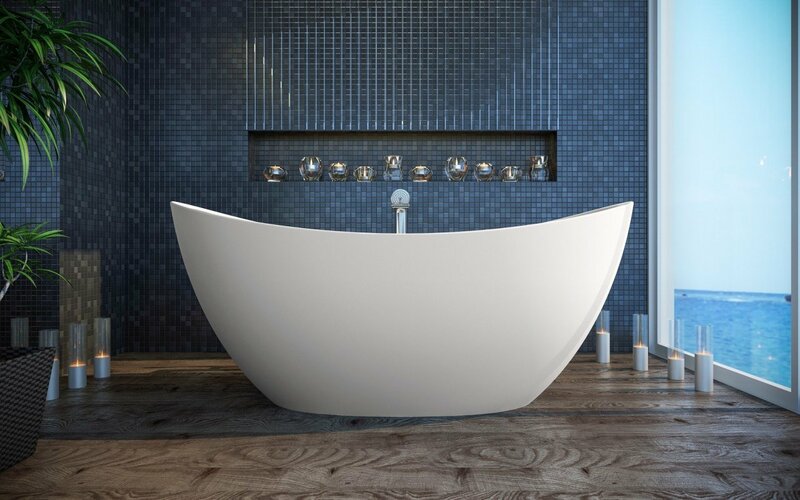 Even if your bathroom isn’t as big as the first one in this article, you can still have a very luxurious and 'slightly' centered bathtub in a bathroom which isn’t as blessed with space! Bring in a freestanding square shaped tub, and while you're at it, you may as well make it a jetted freestanding bathtub, for extra luxury. If you have a separate bathroom with a shower and toilet, then using the bathroom just for the bathtub itself, is the perfect opportunity for a centered bathtub. Another epic example of placing the bathtub right in the middle of the room. Having a centered bathtub in a bathroom that has huge windows and loads of light, will actually make the bathroom look bigger, more spacious and clean. Of course, a freestanding bathtub is perfect for a bathroom this big, but you could also use a built-in bathtub in a bathroom this big, creating a central and focal point for the bathroom’s decor and mood. With as much space as this bathroom has, makes it the perfect opportunity to place the bathtub right in the center, with two large vanities on either side. Instead of going for a freestanding bathtub, opting for a built-in bathtub with a ton of surround counter space, has made this bathroom look and feel like a home spa. 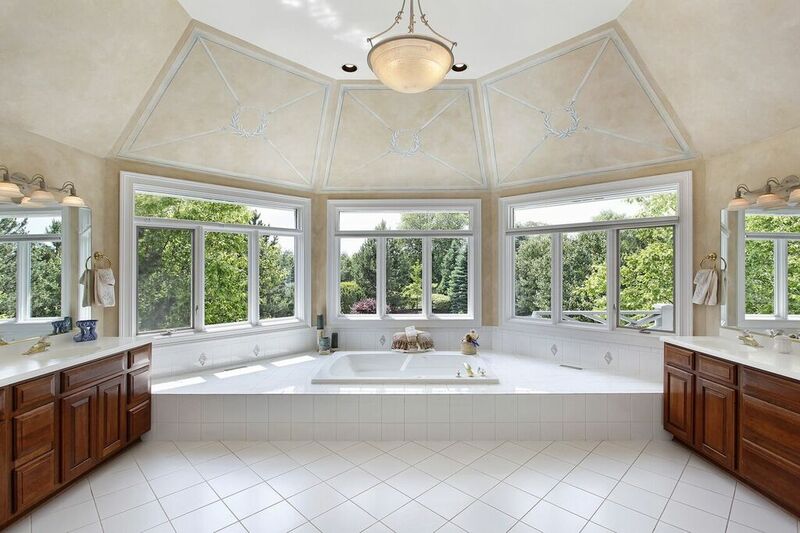 The entire bathroom looks so much bigger with the main focus sitting on the built-in jetted bathtub right at the end and smack dab in the center. There are so many ways that you can use a bathtub in the center of your bathroom, all it takes a is a little bit of extra inspiration and creative research and you’ll have the perfect layout and design suited for your needs and wants! All you need to do is be open to the idea of using a huge space for your bathroom, which in all honesty, you’ll never regret.